General Gamelin is replaced by Maxime Weygand as Chief of the French General Staff and C-in-C of all theatres of operations. Marshal Henri Petain, the hero of the First World War, is appointed as Deputy Prime Minister. German troops of 20th Panzer Korps (Reinhardt) capture St. Quentin. The rapid German advance now poses a threat to the remaining RAF aircraft in Belgium. Evacuation of the remaining squadrons is carried out over the next two days, and fighter operations over the battlefield are carried out by Hurricanes and Spitfires based in southern England. 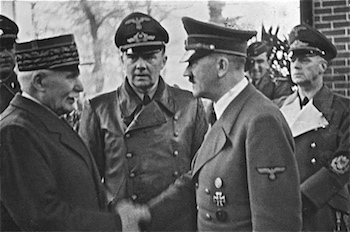 Vichy France announces release and repatriation of 100,000 French POWs. In order to save life’s and aircraft in the face of total Luftwaffe supremacy, the RAF evacuates all its aircraft and personnel from Crete to Egypt. The British capture Fallujah in Iraq after fierce fighting. They also bomb Baghdad airport. Egyptian liner Zamzam reported sunk by Germans in the South Atlantic, passenger list included over 200 Americans. The German 6th Army launches an offensive to the North of the Russian salient in order to link hands with Kleist’s Panzers who have ripped a 50 mile gap through the Red Army’s flank. With the Germans cutting off the Russian Barvenkovo offensive from their rear, the Russian cancel their offensive, do a fast U-turn and try to fight their way out of the pocket and back to safety. Unfortunately, the attack is badly organized and uncoordinated. A busy day for Soviet partisans, who blast railway tracks between Bryansk and Roslavl at five points. Hungarian security troops move in to fight the partisans and do so by killing everyone in the local villages. An irritated Josef Goebbels diaries “In consequence, we can hardly get any agricultural work done in such regions. In an address to the U.S. Congress, British Prime Minister Winston Churchill pledged his country’s full support in the war against Japan. Eden tells the House of Commons that 47 RAF officers were shot while ‘escaping’ from Stalag Luft III. British troops capture Aquino airfield in the Liri valley, to the South East of Rome. Wake is Island secured, during which 800 Japanese are killed. Allies discontinue trans-Atlantic and Mediterranean convoys.